We offer only the highest quality of service when it comes to deliverers, we use only the best equipment to make sure the job is done safely and most of all damage free. We treat your house as our own, and ensure that it is left exactly the way it was before we came. Our delivery days are Monday, Tuesday, Thursday, Friday and Saturday, in some cases we can even offer same day delivery. We also can arrange for our professional installer to install your dishwasher, OTR, wall-oven, cooktop, and waterline. We also can even recommend a local company to help with any gas fitted equipment. We also have a complete home electronics department with custom installation including; delivery, TV set-up, wall mounts and custom installation of audio equipment. Please call or email us for more details on our premium services. We feel that a service department is crucial in maintaining quality customer service. 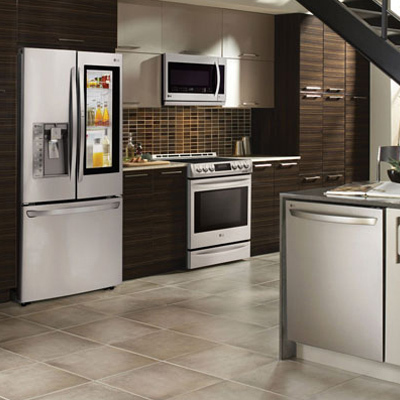 Our service techs are trained and certified to work on all major brands of appliances. We also are able to maintain and repair gas appliances, such as cooktops, ovens, ranges and gas dryers. Our service department is open Monday – Friday, 8am-5pm for our customers convenience. We also carry a huge parts department, ranging from dishwasher handles to compressors. If we don’t have what you’re looking for, we can order it and in many cases we can have it in 24-48hrs to our store. indicated on the invoice, unless otherwise indicated. SOS agrees with the purchaser of the product(s) and this Plan (the OWNER), to cover manufacturer's defects in materials and workmanship that are a result of normal usage for the period specified on the sales invoice, subject to a maximum of five (5) years combined coverage from the original date of purchase. The Plan begins at the expiry date of the Manufacturer's Warranty and is between SOS and the OWNER. This Plan pays for labour and functional parts. Functional parts are those component parts that are critical to the performance of the products essential function. Nonfunctional parts are those that are not critical, knobs, handles or cosmetic parts. SOS will repair or replace the unit or any parts thereof, as required, subject to these terms and conditions. SOS is not obligated to renew your Plan, however, if renewal coverage is offered, the price quoted will reflect current service costs and the age of the product. For replacement/exchange Plans we will direct you to the location to exchange the Covered Product. You may be required to ship the Covered Product to a designated location before being able to receive your replacement. This Plan does not cover failure as a result of: normal wear and tear, misuse, abuse, rust or corrosion, spilled liquids or foreign objects found inside the equipment; repair of damage or food loss caused by accident, theft, fire, flood, external causes such as, but not limited to, blown fuses, inadequate electrical power, water and gas lines beyond the equipment, plugged drains, normal wear and tear, or any use of the product not authorized by the manufacturer. The maximum liability for this product shall not exceed the original purchase price for this product. SOS reserves the right to repair or replace the covered product with a comparable feature model of like kind and quality. Product replacement under this Plan will fulfill this agreement in its entirety and will discharge all further obligations under this Plan and the Plan shall terminate. This Plan does not cover deterioration of the appearance of the product, any cosmetic part or finish defects such as paint, porcelain, glass or plastic, dents, scratches, chips, breakage, loss, rust or peeling. Plan coverage is provided for personal use products only. Products used for commercial purposes are excluded from coverage. Replacement costs of batteries, light bulbs, fuses, filters, drums or any other product with a pre‐determined life expectancy are excluded. Charges incurred for the following items are not covered by this Plan: set up, installation or system configuration. Any loss occurring during the manufacturer's Plan is excluded and any loss due to failure to follow manufacturer's recommended maintenance, specifications or operating instructions during the term of this Plan is excluded. SOS is released from all liability due to indirect, consequential, or incidental damages. Any costs related to installation and/or re installation of products are not covered under this Plan. Upon approval by Peterborough Appliances, this Plan is transferable; to a subsequent owner, or a new product, if your product was replaced by an Insurance Company. The Plan owner may cancel the Plan for any reason within thirty (30) days of the original purchase date of the Plan and receive a full refund. SOS may cancel this Plan for reasons, including but not limited to, misuse of the product, unauthorized modifications to the product or commercial use of the product. In the event of cancellation by SOS (except for non‐payment), SOS will provide the Plan owner with a pro‐rated refund. Any loss resulting from manufacturer's recall or rework, regardless of the manufacturer's ability to pay for such repairs, is excluded. If service is provided on‐site at your location, a person who has reached the legal age of majority must be present at all times during the service call. In the event that a covered product is damaged by lightning or a power surge, coverage under this Plan will apply, provided proof that an approved power surge protector was in use at the time of damage and any additional conditions included herein. “Lemon Aid” policy: While covered under the manufacturer's Plan and this Plan and after the product requires covered service on three (3) separate occasions for the same component and this product requires a fourth repair, as determined by our service center SOS will replace the product with a product of comparable performance, the value of which may not exceed the original purchase price. Product failures must be covered by terms and conditions of this Plan. The time remaining on the Plan will be applied to the replacement product. In the event of mechanical failure of a freezer covered by the terms and conditions of this Plan which causes spoilage of frozen foods, SOS will refund the amount of the actual loss to a maximum of $250.00 and $500.00 in a chest freezer during the term of this Plan.